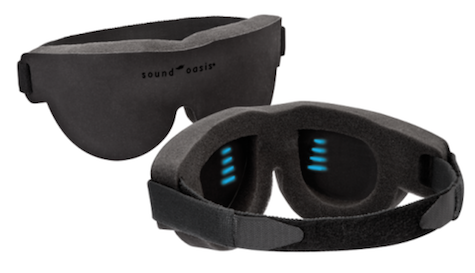 There’s a lot going on with these sleep-assist eyeshades. First of all, there are the shades themselves. They’re made of a stiff, puffy foam. Great for cradling the face without squishing your eyeballs, excellent for blocking light. But terrible for sleeping face down which I unfortunately like to do. Then there are the points of light. These are glowing, light activated dots on the inside of the shades. You expose them to a bright light for thirty seconds, and then they glow for several minutes. Think glow in the dark stickers. 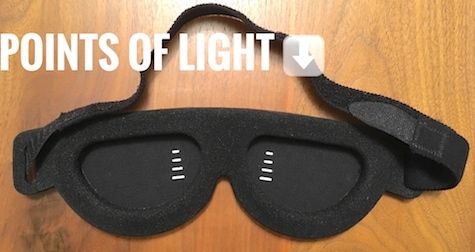 Once they’re activated, you put on the shades with your eyes open, focus on the glowing spots, and breathe deeply. I’m not sure if the glowing spots actually did anything but it did force me to breathe deeply which was very relaxing! There is also some kind of guided meditation that you can download and listen to while you’re breathing deeply but that kind of thing always keeps me up so I skipped that step. Overall I would recommend them as long as you’re not a stomach sleeper. They seem like they’d be great for use on an airplane. MyMac Review Rating is 8 out of 10 for back and side sleepers.